"Is Obama's Deck Stacked Against Us?" "The marvel of all history is the patience with which men and women submit to burdens unnecessarily laid upon them by their governments." For several years now, we have tried to convince our audience that it may not be possible to win our freedom and property rights battles within the confines of the law, or through the legislative or judicial branches of government. It would appear that the deck is stacked against us. And certainly we will win nothing by approaching the executive branch, especially the executive branch now occupied by the committed socialist, Barack Hussein Obama. It is alleged that Alexander Tyler wrote the following statement in 1787: "A democracy is always temporary in nature; it simply cannot exist as a permanent form of government. A democracy will continue to exist up until the time that voters discover that they can vote themselves generous gifts from the public treasury. From that moment on, the majority always votes for the candidates who promise the most benefits from the public treasury, with the result that every democracy will finally collapse due to loose fiscal policy, which is always followed by a dictatorship." Whether Tyler wrote the statement or not, it still holds true and the statement has manifested itself right in front of our very eyes in America ..... in spades. Ever since President Wilson and the passage of the 16th Amendment in 1913, and maybe even before, Americans have become locked in indentured servitude to an all-powerful central government. How can the people unlock their chains if the deck is so stacked against them that the chains cannot be broken without violence? There are five forms of redress of grievances by the "people" to government. 1) Petition the legislative branch of government either directly or by votes; 2) Bring court actions to defend and uphold our individual constitutional rights; 3) Engage in massive protests at the foot of government's door; 4) Civil disobedience and defiance of unconstitutional law and finally 5) armed revolution. If the first two forms of redress have been "closed" to the people, there are only three forms of redress remaining. The third and fourth forms require a huge outpouring from aggrieved and angry Americans. Protests and civil disobedience must be in the tens of thousands, if not the hundreds of thousands. And to be effective, any protests must be brought to the individual legislators and justices at the foot of "their" doors where they live, not at the capitol building, or at the halls of justice. Decision-makers must be made to feel the pain of their decisions where they live. They must suffer, as we are, for confiscating our rights and our property. They must pay a price for violating their oath of office to preserve, protect and defend the Constitution if they cannot be thrown from office, or impeached. They must be held accountable for allowing the bureaucracies they created, like the IRS, the EPA, the DOE and others, to become corrupted and run amok. And their families should also pay a price for being complicit with the decision-makers. Perhaps the wives and children of the decision-makers, under pressure from peaceful protesters, can convince the decision-makers to behave as not only representatives of, by and for the "people", but guardians of our Constitutions. But if the people do not organize and rise up exponentially in huge numbers, the people have no chance of winning their freedom. With regard to civil disobedience and outright defiance of unconstitutional law (redress No. 4), John Locke wrote: "Whenever the legislators endeavor to take away and destroy the property of the people, or to reduce them to slavery under arbitrary power, they put themselves into a state of war with the people, who are thereupon absolved from any further obedience and are left to the common refuge which God hath provided for all men against force and violence." Are the people in a state of war with government? It would seem so now that the door on the jailhouse cell has locked us in and bound us in the chains of Obama Care, enforced by the arrogant, abusive and corrupt IRS. Unfortunately, recent decisions by legislators and the courts only embolden government and the lobbyists, to continue their actions. Only WE THE PEOPLE can stop them, but will we? If the right of protest and civil disobedience, the third and fourth forms of redress of grievances, produce no results, there is only one form of redress remaining and it is the hardest and harshest of all the five forms, with no guarantee of success. But civil disobedience and defiance of unconstitutional law must be done on a large enough scale or the government will make terrorized victims out of the few that try. "Civil War is upon you, whether you would have it or not. The time has come to realize that words and the election process will not avail to turn the tide that is rushing toward you. The time for idleness has ended. The time for action is upon us. Yes, I am openly calling for Civil War, for the Confederacy and the　Red States to　secede, peacefully if allowed, by force of arms if not. The time to act was long ago, the window to act is almost closed. Our country is being bankrupted, our morals and religion destroyed by all manner of perversions and horrors, our top military generals and leaders　fired, our borders left wide open, deceptive legislation designed to subvert our freedoms and our way　of life are being passed with little to no resistance, and our status as (a) superpower almost gone. This is all by design, moves on the chess board." This author obviously believes that "The Deck is Stacked Against Us" and that the normal forms of redress of grievances are no longer effective. But then it was stacked against George Washington as well. He didn't quit or we would all be speaking King George English. A while back we watched a two-hour special on George Washington, the Warrior. It presented our first president at first as a bungling British officer at the tender age of 22, with a military career that could have ended in abject failure. We missed the first few minutes and thus didn’t learn how he had obtained the rank of major and then lieutenant Colonel, at such an early age. His almost downfall came during the opening of the French-Indian Wars (circa 1755) in one of the first skirmishes with French Troops and the unnecessary killing of a French Ambassador that caused an international incident. George was learning the hard way, as most of the rest of us must learn, the hard way. To add insult to injury, he set up a fort at the sight of the first battle with the French and ended up losing almost his entire command to the French because of his in-experience. How he managed to either survive the battle or save his military career goes deeper into history than space allows. But survive he did. In fact, in another battle with the French, his British commander was killed and he took over in an absolutely chaotic situation of death and mayhem. He organized the remaining troops and staged a retreat that saved many of his men. Musket balls were flying everywhere and some went through George’s tunic, but he escaped the battle without a scratch. It was clear that George, the man and the officer, was beginning to get his stride. George retired from the service and became a gentleman farmer at a plantation in Mount Vernon, Virginia that he inherited from his brother, after his brother died. George later married Martha, a wealthy widow with two children. One of those children would die in George’s arms during an epileptic seizure. It was at the Plantation that George learned more critical skills. By 1775, the British were getting a little tired of the colonists resisting their rule and taxes and commenced outright war against them. The skirmish with 600 British soldiers and some American militiamen at Lexington became the "shot heard around the world." The Revolutionary war that ensued is a matter of history, but what may be little known is the enormous part that George Washington played. Single-handed, George held a rag tag army together and with the help of the French (war does make strange bedfellows) bested the British to win our freedom. Many times George Washington, mounted on his horse, would race out in front of his men, in between them and the advancing British soldiers, to spur his men on and lead them to victory. Time after time he braved musket balls, bayonets and cannon fire. At any moment, during any battle, he could have been killed. Yet he lived to become the first President of the United States. Washington had to beg the early Congress to give him the materials he needed to prosecute the war. Time after time his begging went unanswered as Congress went into hiding. Washington's biggest problem was resignation and desertion. Dozens of his men went home sick. Still more left because of pleading letters from their wives back home. Some officers quit after Congress refused to promote them. Many of the troops were simply fed up and warn out. There were not enough guns, blankets, or food. Illness was rampant. Nevertheless, Washington and his men advanced on a British position, many of them in bare feet, at night, in the middle of winter, with deep snow on the ground. They won that battle, in spite of the unbearable hardships. Many wanted to return to their homes after their enlistment expired. George convinced them to stay one more month to win another battle. Many stayed much longer. In a winter camp, as men were dying at the rate of 10 per day, he held them together to fight again. Without George Washington, America would not exist. So one man can make a difference, even if the deck is stacked against him. Think what great things we could do in America with many men, or women, who were as brave, steadfast and dedicated as George Washington and who strongly believed in freedom enough to drive he and his men into oblivion, if necessary. Who among you? It isn't necessary ..... yet, to ride into battle with guns blazing. So who among you will challenge unconstitutional laws? Who among you will organize protests, local, state, or federal? Who among you will risk fighting the IRS ..... as we are? 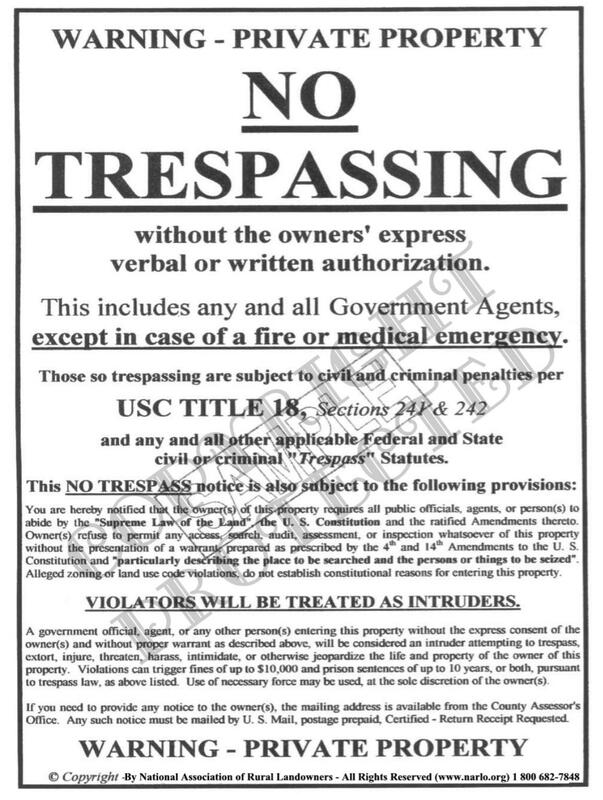 (review the details of our fight HERE, including our Criminal Complaint filed with the FBI) Who among you will tell a government agent to get off his or her land? Who among you will take their day in court to prove that the law (or laws) they are being forced to follow have no basis in constitutional law. Who among you will say an emphatic NO! to Obama Care? Who among you will get out and support and fund a candidate that espouses the principles of liberty? Ladies and gentlemen, if Americans don't start saying NO! to government, in no uncertain terms, then Americans will have to get used to the chains around their necks. Millions of Americans are already in the virtual chains of government tyranny, or they are the recipients of government largess and will not bite the hand that "feeds" them. The tragic part is, this is America's reality. It is not fantasy. Does Obama or the Democrats hold all the cards? Only if the people of conscience let them.